Question: Have there ever been people who listened to Kabbalists and followed their advice? Answer: In ancient times, it was not about one Kabbalist or another, but about a whole period of development: the era of Abraham, Isaac, Jacob, Joseph, Moses, and Joshua…Those are periods, rather than people as such. The spirit of the person was active in that time and made what it did. For example, Moses built the nation and contributed the methodology of correction to the desires that were unveiling at that time. As a result, he brought the nation to the Land of Israel, that is, to the revelation of the Creator. Everything is carried out by the Kabbalists, although we cannot see it during the exile. Kabbalists are the ones by whom the world is being “charged,” which allows it to exist. Without a sparkle of Light, this world would never have appeared in the first place and matter could not have existed. There always are the Kabbalists who, according to their Kelim, belong to the generality of humanity as well as to a spiritual degree. It is said that “the tail of the lion,” the nine lower Sefirot of the world of Atzilut, together with the Light of Hochma descend to the worlds of BYA and become “the head of the fox” (shualim), in other words, those who ask questions (shoalim). After all, that’s where the broken vessels are located, and so, the question arises: How do we correct them? We need this connection as well as a permanent opportunity to transition between the levels. In this world, it is ensured by the Kabbalists. On one hand, they are dressed the same as others so that they can teach us. On the other hand, they are a part of a higher degree. There is no other way to achieve this because we are a part of the general system that lives in accordance with rigid laws. Returning to the question:. After a long exile, Jewish people listened to the advice of the great Kabbalists during the time of Baal Shem Tov and his disciples. They led the nation, guided it forward, and gave birth to generations who lived in accordance with spiritual attainment—to people who connected “the ground” of this world with the height of Ein Sof (Infinity). It was a period of great Kabbalists who were operating in both worlds at the same time. As to the severe detachment (interruption) of the spiritual connection that was created within the last one hundred years, it is probably something that was supposed to happen. The situation is really critical at this time. And yet, it is said: “I have not forsaken Israel.” Even today, there are Kabbalists who convey illumination from the spiritual world to ours. Our world is a tiny dark spot in the center of spiritual universe. It is essential to bring the Light into it, otherwise it won’t be able to endure. Throughout all the worlds, the Light descends directly to this plane, to our corrupt desires, and Kabbalists are the ones who safeguard this ray of Light. You call them “people,” although it has nothing to do with a body, but rather it is about certain desires or states (Kelim). They act deliberately, so that they can descend even lower and be closer to us. For example, Baal HaSulam asked to be lowered in order to be able to write and help those living below. In the News (from Kurzweil): “To Peter Turchin, who studies population dynamics at the University of Connecticut in Storrs, the appearance of three peaks of political instability at roughly 50-year intervals starting with the U.S. Civil War is not a coincidence. For the past 15 years, Turchin has been taking the mathematical techniques that once allowed him to track predator-prey cycles in forest ecosystems, and applying them to human history. “If Turchin’s prediction of unrest in the United States around 2020 is correct, the next few years should see an increase in tightly knit US groups whose rituals have a threatening quality but promise great rewards. My Comment: An integral society, which we have to accept and which obliges us through the evolutionary development of society, assumes a uniform level of prosperity for everyone, that is, to achieve relative equality for everyone, like in one family. Only in this case will we obtain stability in our new development. Those who are going through integral studies need to know that they aren’t assembling together as a regular group for pleasant communication that might not lead to anything: to talk and flee. They gather together in order to connect with each other, and in this connection to realize the next level of their perception, of the communication between them, of their state. The matter is that everything we are based on in our everyday life comes to us at the level of inanimate, vegetative, and animate nature. Thus, psychologists deal with psychology on the animate level of humans, and we deal with human psychology, the psychology of “turning” people into human beings. Therefore, at the beginning of the studies one needs to explain the task to people so that they’ll understand how serious and special it is, and that it requires a certain inner tension from them. In our regular life, we are directed through instincts that come to us from our ancestors, from the tribal feeling that existed long before the appearance of cultures, the development of civilization, and long before the technological and social progress. We use these instincts unconsciously, but they constantly direct us, and we can’t rid ourselves of them. This is the failure of all psychological treatments, since we try to treat human society, the communication between people and of man himself, as part of the society at the same level he is on today. It’s as if we try to change the instincts, the communication between us, and that’s practically impossible. We place the person in certain narrow limits where there is some kind of correction, and as a result of that it’s more convenient for him to do it this way or that way. He somehow combines within him his instincts, manipulates them a little, and it seems to us that he behaves correctly, according to the desires of society, the family, etc. But it is not enough to attain the correct behavior from a person today. Thus, lately, psychology has developed in order to realize, to some extent, the way to change a person, the society, a person in society. But the important thing is to discover its initial failure, and rise to the next level. The current state of the world is much worse than we feel, see and know. It is true that we do not talk about it because politicians and economists are not interested in creating a panic. They have no answer to the question about the crisis. They have no answer, and there is nothing you can do. Why should one panic in vain? And they’re right. But we need to provide to people who are in a state of fear of hunger, drought, cold, shock, and the unpredictable approaching from all sides now. We should try to absorb all the animal fears of the world, fears of survival. They help us to gather and reveal that force, the surrounding Light (Ohr Makif), which will pass through us to the world, and everything will calm down. All the countries, societies, and people will begin to interact because they will understand that this is the only way to bring the world to balance, that not the still, not the vegetative, not the animate nature, but only the human being disturbs harmony, and everything else is disturbed by his egoistic actions. We lack anxiety; we lack internal hysteria. If it were there, it would be easier. Our problem is that we are disconnected from this world and try to find a quiet corner somewhere in our higher place. This is not good. On the contrary, we should find, on one hand, the state of the greatness of the goal, and on the other hand, inner fears, because our egoism is fed only by these. Fear and the greatness of the goal are two great forces that are pushing us from behind (fear) and drawing us forward (the greatness of the goal). They will help us to unite. We should put pressure on ourselves to try to absorb from the world all of its negative feelings that arise in connection with the crisis and to turn them into the force of our development. Indeed, development occurs under the law of “negation of negation.” Until we feel more or less normal, we will not come to the next state. Only suffering or the greatness of the goal, when I suffer because I don’t have it, makes us go. There are two types of suffering: suffering from a lack of feeling and suffering from unfulfilled love. The Crisis, When Will We Become Aware Of Your Cause? A workshop is a special action. I would say sacred. We are going to clarify a question, namely to clarify, not to answer, so that it is clear to us. Then, I will talk about it to explain it in a few minutes. And then, sitting in a circle, we will discuss how to find a logical solution, the real solution to this question, but not what is described in our books. In no case we should rely on the wise sayings of Kabbalists, rather we communicate from our heart to keep connection with each other. However, I must accept a friend as great, infallible. It does not matter what nonsense he says. It is my feeling that he is stupid; I feel that I see it because I am not sufficiently connected with him. If I loved him, I would have felt through him that the Creator speaks to me. Thus, while sitting in a group of ten, we must understand clearly how to relate to each other. Representatives of the Creator are sitting in front of me, and they tell me the absolute truth. I have to suppress any criticism, any distrust, anything that might alienate me from them. They are, without realizing it, saying the things that I cannot agree with. I am against it; I don’t want to hear it; I see everything stupid as having long passed, standard, and identical. It all seems so to me so that I rise above myself. So, here we face a huge internal work. Question: What should we expect from dissemination? Answer: Dissemination makes new points in the heart (•) awaken below, who come and join us since they pertain the category of Israel, like all our friends around the world. This is the upper Partzuf. Below is the part that pertains to Israel from birth. In other words, it already has experienced spiritual ascent and breaking, and lower is the part of the “nations of the world,” souls deprived of Reshimot, the “genetic” spiritual memory, and they lack the point in the heart. They are awakened by the Surrounding Light. 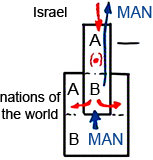 Let us examine this through the simple design of two Partzufim—Israel and the nations of the world—where each one divides in two: an internal part (A) and an external part (B). Israel has a point in the heart, and must maintain a connection with the upper Light, attracting it and introducing it into the inner part of the nations of the world. We, like the nations, also have problems, only we regard them as the means for advancement. However, if we were to advance at the right speed, we would not experience problems. We would only reveal the need for adhesion in its pure form. Problems, which do not seem to be related to spirituality, are caused by our delay in development. Regarding the nations of the world, they must pressure us with the so-called MAN (appeal for the Light), and we must pass this pressure above, also as a request, but of a different quality. However, our state is not yet corrected the way it potentially can be corrected, and this is why, instead of feeling a spiritual appeal from the nations, we feel physical pressure to the point of hatred, murder, and threats of complete destruction. Instead of spiritual means, the system influences us with rough, physical methods because there are no appeals or answers to these appeals going through it, and there is a bad negative connection between its parts. Question: What should spiritual pressure be like? How is it different from physical pressure? Answer: Spiritual pressure also manifests physically, but in accordance with our degree. The upper governance never changes. It is the same “Good Who does good.” He only appears to be very bad when we fall behind. A child who has failed to graduate the third grade when he should be in fifth grade, regards his parents the same way. Their demands seem to be extreme, harsh, and very difficult, but it is only because he is not yet ready. If he wanted to correspond to his level and advance, he would regard his parents’ demands as helpful, and then they would direct him toward the next degree. Instead of hard pressure, he would feel as if he were being taken by his hand and guided in the right direction. To help a child solve a problem at hand, he is asked leading questions that help him advance, become wiser, and grow. He is given building blocks, puzzles, and other games, to help him develop, and he understands it. However, what can you do when it is time for him to learn to play chess, and he still walks around with a pacifier and plays with rattles? So, when we are on an adequate level of development, we then experience the upper One as “Good Who does good.” We feel while in the opposite way that: He wants to pull us to the next level and this is why He has demands; however, we read these demands incorrectly. Today, we are in the middle between this state and regular concealment where it already is possible to justify the upper One and understand that He conceals Himself in order to raise us and take care of us. This is similar to the way a child receives a set of building blocks and not the actual construction, not the prepared result, and if the child is bright, he understand that this is done for his own good, for his development. How To Fulfill The Desires Of Others?